George Chouliarakis is the Alternate Minister of Finance and Chairman of the Council of Economic Advisers of Greece. 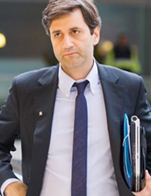 From May to August 2015 he served as chief technical negotiator for Greece for the third bailout program and subsequently as interim Finance Minister in the run up to the elections of September 2015. He is a member of the Eurogroup Working Group (EWG) and a member of the Board of Directors of the European Stability Mechanism (ESM). Prior to his appointment, he was teaching economics at the University of Manchester. He also taught economics and economic history at the University of Essex and was a visiting scholar at the Bank of Greece. He holds a BSc in Economics from the University of Athens, an MSc in Economics from the University of London and a PhD in Economics from the University of Warwick.